I know today is not our normal flashback day, but I wanted to share this picture of Sol and the boys to celebrate St. Patrick's day. Sol was never one for dressing up, but she sure could rock a bandana. On a sadder note, March 8th marked the 4th anniversary of Sol's passing to the Rainbow Bridge. In many ways it doesn't seem like that long ago. Of the pugs, I think Luna misses Sol the most. Which is odd because I was worried about how two alpha females would get along, but they got along fantastic. Sol had a calming effect on Luna and helped Luna let go of a lot of her nervous energy. I don't know how Sol did it, but somehow she managed to communicate and let Luna know that all was ok and that she could just relax. In teaching her that great lesson, Sol always taught Luna a few tricks on how to always get her way. I'm thankful for the first gift Solsey, but I could have lived without you sharing your knowledge on how to always get what you want. For black friday, I wanted to share a picture of Sol that always cracks me up. What I love about this picture it is shows just how much of a ham Sol was and how she was pretty much up for anything! If you want to stroll down memory lane here are some Sol stories shared on the blog. Two years ago today we said goodbye to Sol. This is a milestone that I was worried about because it means that Sol has now been gone longer than she was with us. While we only had 15 months to share with Sol, I know that she lived a full life and I am even prouder that her memory lives on with the Central Florida Pug Rescue's Sol Sunshine Memorial Fund. 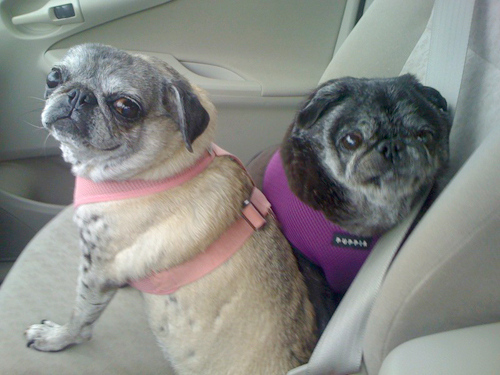 So far over $2,300 has been raised to help the hospice pugs of Central Florida Pug Rescue. And if those pugs are anything like Solsey, which I know they are, they are living out their golden years in grand style. And that is because of the loyal OBP readers. Your support of Sol, Benjamin, Henry and Luna over the years has been tremendous and I can't thank you enough for helping the memory of Solsey live on through your generous donations. Say what you want about pug people, but they are some of the nicest and caring people I know. Thank you for supporting Sol. I don't have words to express how grateful I am for all your support. Luna has taken a liking to Sol's favorite dog bed. The bed still sits under my desk in my office even though Sol hasn't hunkered down in it for a nap in almost 2 years and I haven't even worked from home for almost a year. Whenever I am in the office tinkering around, Luna makes a point to find the spotted bed and snore away at my feet just like Solsey used to do. Sol Playing from obp on Vimeo. I recently found out that today is National Pet Memorial Day. So, I thought I would post a picture of Solsey today and give an update on the Sol Sunshine Memorial Fund. As of this writing, $2,298.90 has been raised to help support the senior pugs of Central Florida Pug Rescue. I think that is awesome! To me, Solsey was the perfect example of how to live your golden years to the fullest. I hope her fund helps the senior pugs of CFPR do the same. None of this could be possible without all the loyal Solsey supporters and the good folks at CFPR. Thank you all for letting Solsey's memory live on in such a positive way! Also, on a different note, I have extended the deadline for submissions to the 2012 Calendar Contest to September 17, 2011. I'm looking forward to your submissions. I always talk about how much of an impact that Sol has had on my life, how she taught me so many things in her subtle ways. But, I think Sol impacted Luna as well. Solsey had a calming effect on Luna. Since the day we adopted her, Luna was always a very nervous dog. Loving, but still nervous. After spending time with Sol, Luna significantly calmed down a bit. She seemed to trust us even more. It was like Luna and Sol could relate. They both came into our home in similar circumstances and Sol told Luna it was OK. Relax. You're good now. Solsey conveyed something to Luna that humans could not. In addition to helping Luna heal, Sol also taught Looney a few tricks. Before Sol, Luna would eat almost anything we put in her bowl. Sometimes begrudgingly, but she ate it nonetheless. Solsey taught Luna that if you don't like what is in your bowl, object. Heck, Solsey demonstrated how to object quite frequently. And Solsey has taught Luna well. Luna continues to object to her mid day meals to this day. At lunch time, the pugs get a little bit of kibble. Since Luna has a hard time chewing the kibble, we give her a little bit of wet dog food. Well, there are a few flavors that Luna does not care for. When we figured out that Luna did not like those flavors we did not continue to buy them anymore. But, we didn't want what we had on hand to go to waste, so we would put down the food and if Luna objected, we would top the food with a tiny bit of cat food. Luna would then happily gobble down her food. Well, what a big mistake that was! Now, at lunch, the little miss, sniffs her food bowl and if there is no cat food on top, she walks to the center of the kitchen and stares at you, wagging her little tail. She'll look at you, then look at the cat bowl, then back at you. And until you put a dab of cat food on top of her food she will not eat. I'm sure Solsey could not be prouder!